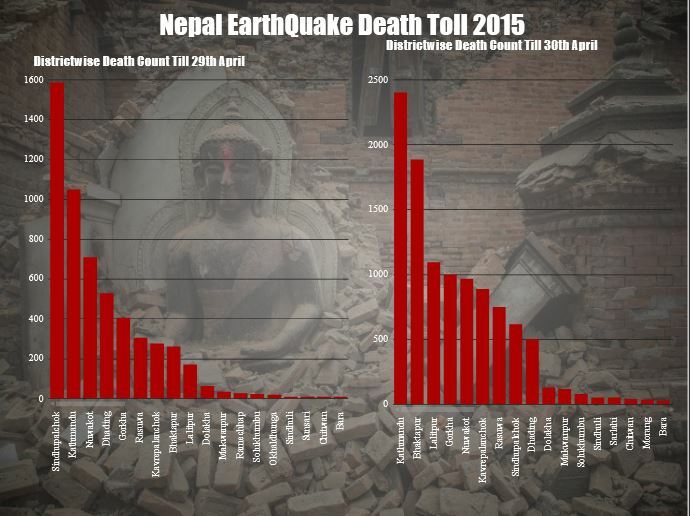 Last weekend, we all were horrified by the terrible earthquake attack over Nepal, India & greater Asia, it’s continued over toll of millions of death which has several parameters to consider like ‘depth of KM’ of the earthquake, ‘magnitude of quake, severity of deaths, number of people died on quake, number of people died on shaking effect’ etc. In this current powerbi demo, we’re using World’s dreadful earthquake incidents happened over the millennium 1900. 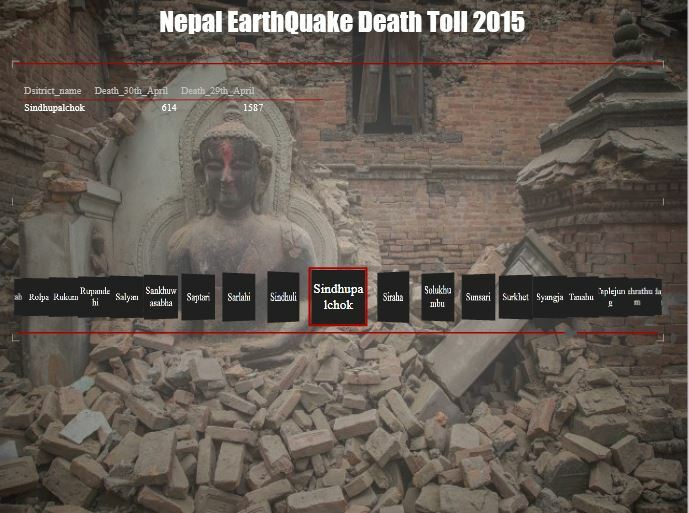 On , Excel power view dashboard, here depicted some the latest death toll analysis report of Nepal Earthquake 2015. 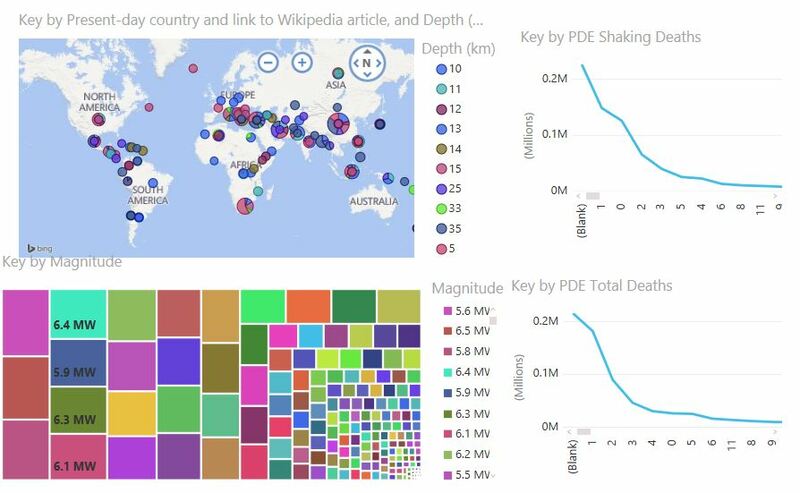 In latest, powerbi designer preview, represented worldwide country wise earthquake magnitude data analysis sorted by Total death & depth of KM of quake intensity. Last month, 27th february 2015 , there are some new awesome features connected with Microsoft PowerBI, lets have a quick look at this, first of all , in this release , the powerbi comes out of office 365 & Microsoft Office veils & you can now connect your data not only from Excel workbooks /Azure but also from PowerBI Designer files, Sendgrid, SalesForce CRM, Microsoft SQL Server Analysis Service, Azure Stream Analytics(private preview). 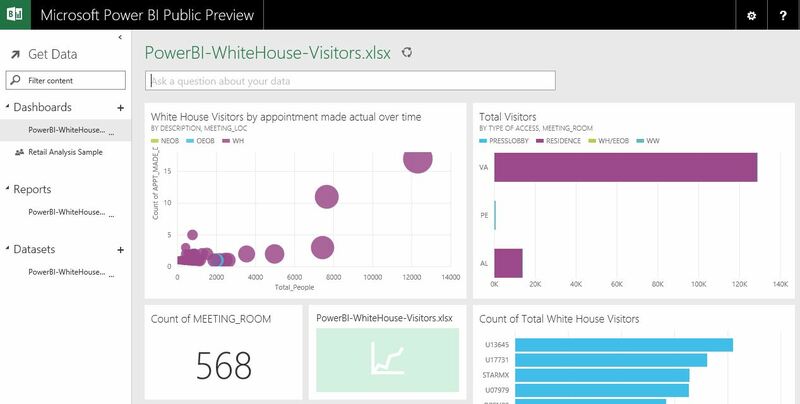 In the first demo, I’ve collected real time data from White House Visitors Records directory using OData feed by Socrata api using this link http://open.whitehouse.gov/OData.svc/p86s-ychb from Excel -> PowerQuery-> OData Feed or Excel-> Data-> OData Feed option. Next, import data into PowerPivot table & build out the linked tables to put out the powerview dashboard. Also, you can sign up for PowerBI public preview dashboard here , but make sure that the preview is now available for users in United States only. The PowerMap tour is compiled along with the latest features introduced as Custom Maps in PowerMap & rich set of effects. 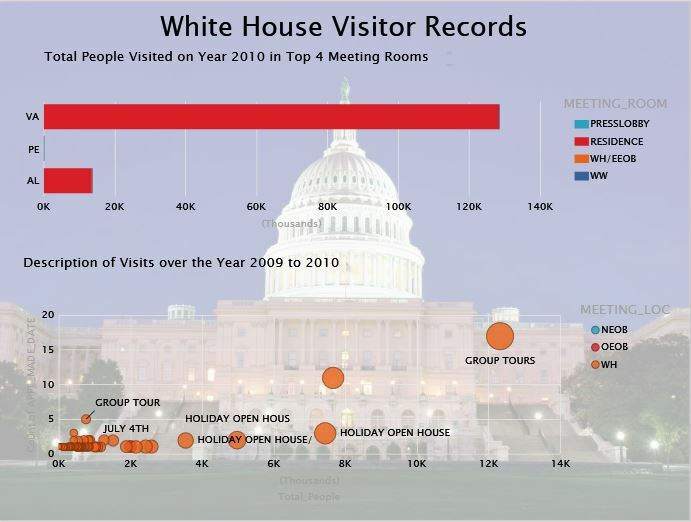 The powermap tour on White House Visitors records index analysis is available on Youtube. 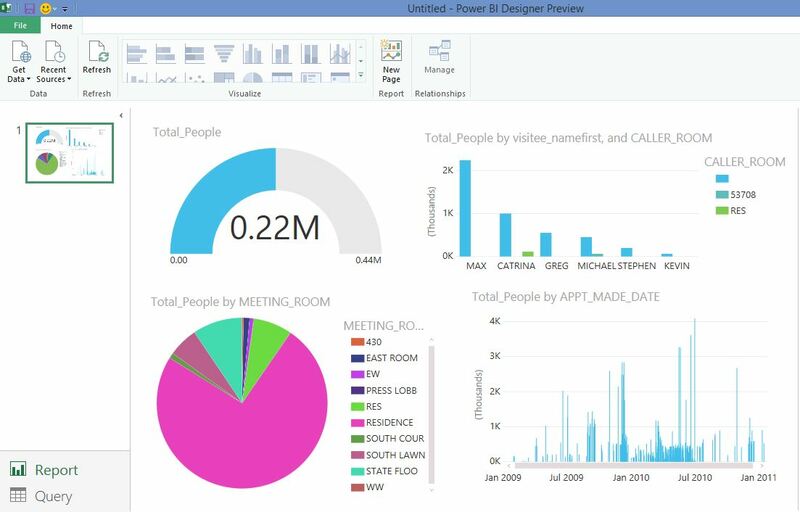 Upload the excel PowerView Dashboard workbook on PowerBI public preview portal & you can view the amazing experience including PowerQ&A without the environment of Office 365. In new powerbi public preview portal , lots of option by which you can import data like SQL Server Analysis Service, Excel workbook, PowerBI Designer files, SendGrid, SalesForce CRM, Microsoft Dynamics, Marketo, GitHub, ZenDesk etc. The new powerbi designer file is available for free download by this link & some spectacular views have been introduced in the designer preview like Tree charts, Gauge, Combo, Tabular etc. In the next demo, I extracted real time 9-1-1 call records index data from http://data.seattle.gov/ & analysed 911 call records index over 2 days , possible report locations, types of reports all over US & of course over greater Seattle Area. There was significant breaking update over last few days regarding Scotland voting referendum 2014, while in social media magnificently came up millions of tweets, likes , shares & overall big sentiment & prediction details about Scotland’s next future declaration. 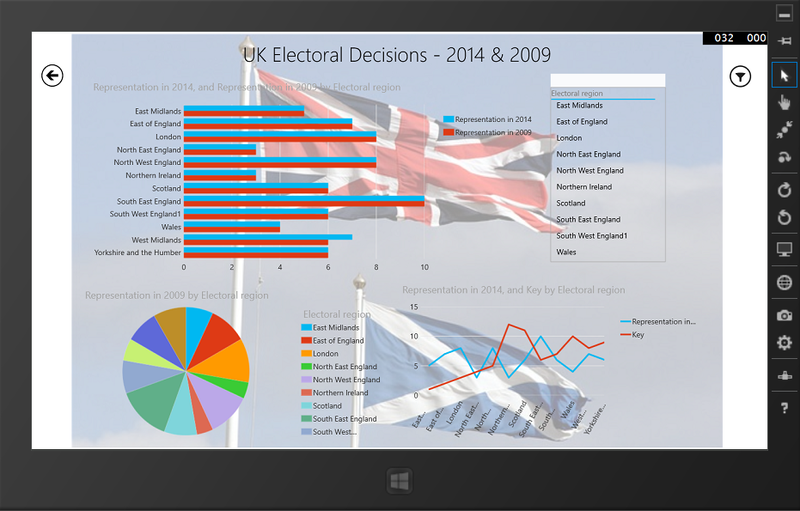 In this demo, we would roll over quite a similar social ramp-up of predictive analysis of Voting results of UK over 2014 & 2009 using Microsoft PowerBI & Office 365. First, throughout the demo, I used the powerbi components like PowerPivot, PowerQuery, PowerView & PowerMap along with PowerQ&A integrated with office 365. 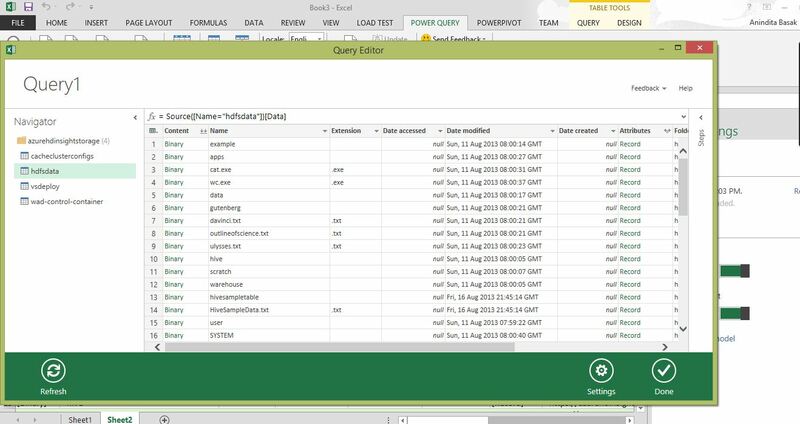 Lets start to consume the dataset from ‘online search‘ feature of PowerQuery. Searched here coined the term as ‘UK parliament elections prediction’ & selected the related OData feed URL. Using PowerQuery editor, analyse & transform the data for processing & feeding into data-model. Next, after building the data-model , featuring appropriate keys with datasets, first build -up the sample powerpivot dashboard. 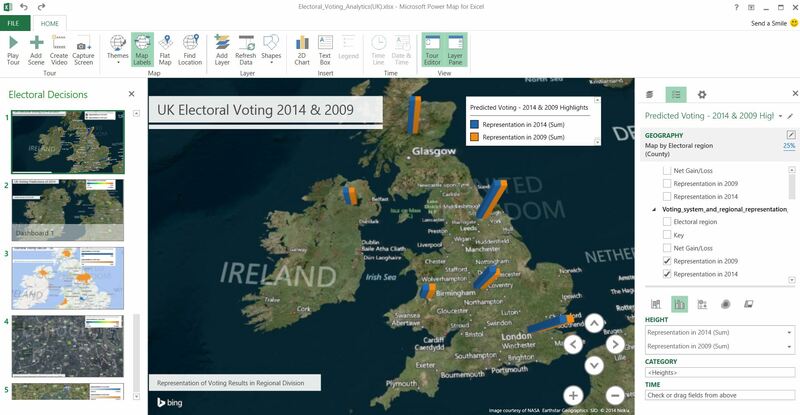 To figure-out powerview reports , simply click on PowerView tab & start build Prediction analysis results of UK electoral decisions over 2014 & 2009. 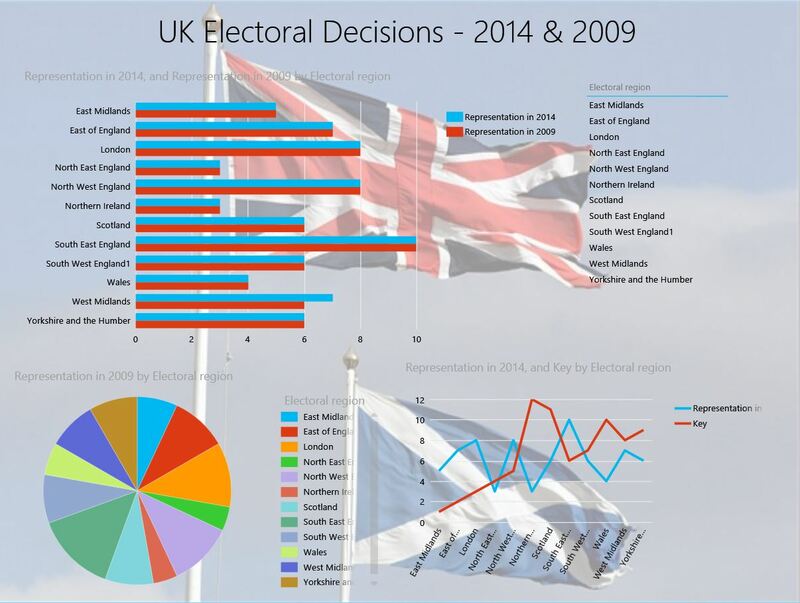 The predictive analytics of UK electoral decisions on 2014 & 2009 has been depicted with respected with representations data & key value of data differentiation which displays analysis through stacked bar & data representations key over entire electoral regions. Next, Click on ‘Map’ icon & select ‘Launch Power Map‘ to build up PowerMap of 3D visualization on predicted analysed result set over the regions of United Kingdom. Create first a new ‘Tour’ & add layer to start move over 3D visualization with realistic dashboard views. 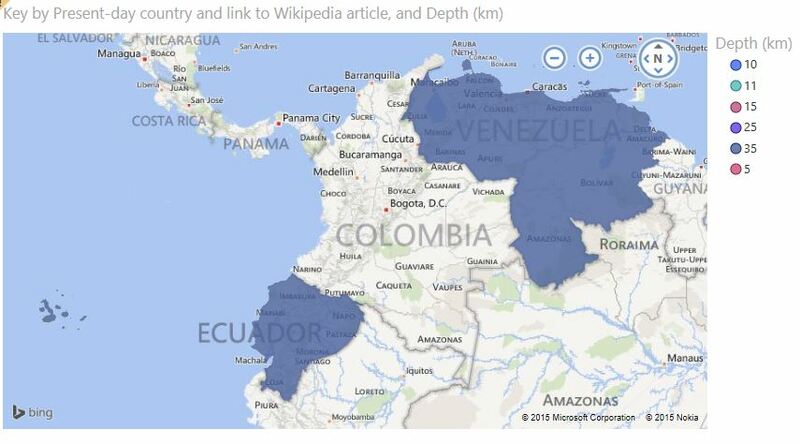 For this demo, I used ‘electoral regions’ as ‘country‘ field to locate the geography on map. I created a video presentation of the powermap 3D visualization tour of predictive analytics results of UK over 2014 & 2009. Next, Check on PowerBI on office 365, you need to have either E3 /E4 subscription of Office 365 tenant or otherwise go for a trial account provisioning from here. After provisioning PowerBI for Office 365, you need to add permissions for SharePoint users. 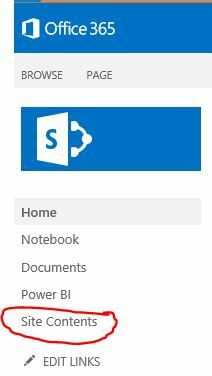 Add ‘PowerBI for Office 365’ tenant under your subscription & move to ‘sites‘ category & click on ‘team site‘ app. Next, inside ‘team site’ portal , you will be able to see the option ‘site content‘ , clicking on it jump to ‘PowerBI‘ section for the office 365 site. Next, after entering into PowerBI tab , add/drag your excel 2013 workbook containing PowerView , PowerMap dashboards into Office 365 portal. Now, add some natural language enhanced Power Q & A on your analytics dashboard , click on option ‘Add to PowerQ&A‘ & start frame up relative questions to build up real time analytics dashboard on office 365. For example, in this demo, I utilized the sample queryset as ‘show representations on 2014 by representation in 2009‘ on powerQ&A query bar. 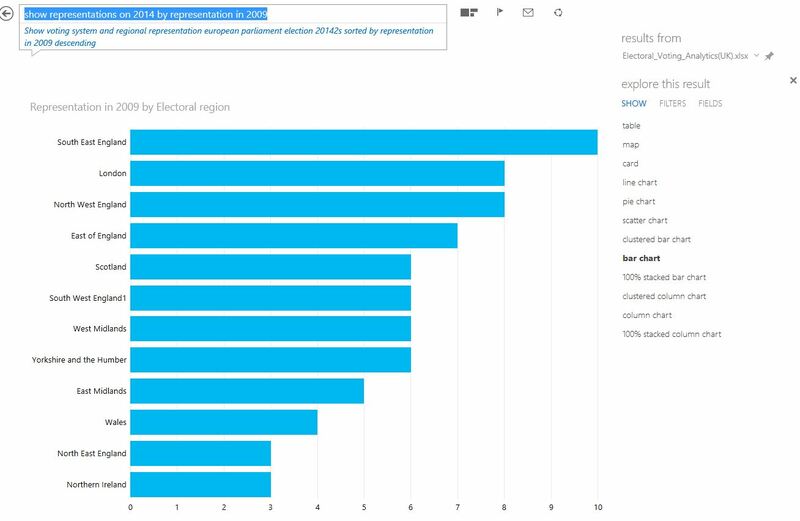 ‘Show Representations by Electoral Regions on 2014’ used as a search term & portrayed the predicted result as like this. 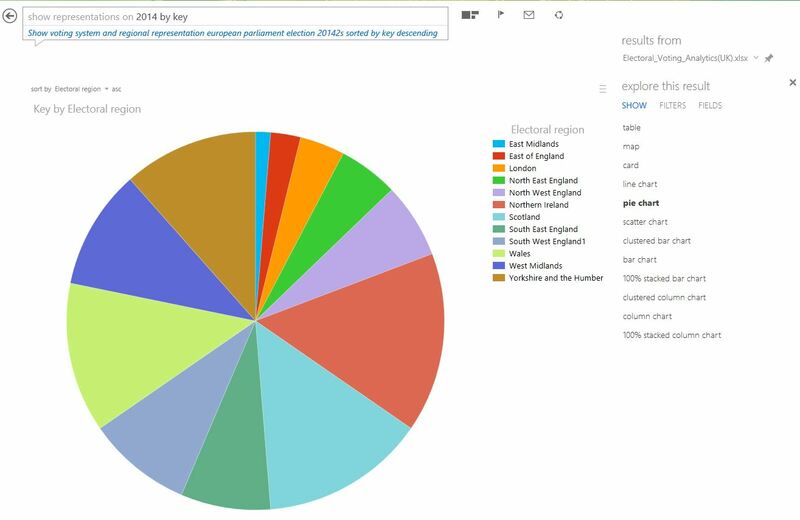 Also, visualizing the PowerBI site on o365 is overwhelming in terms of real time analysis all over the dataset & collaborating with the team. Lastly, to access the real time predictive analytics report on PowerBI is accessible through PowerBI app on Windows Store which leverages to share , collaborate your analytics results on any device & enables to view it anywhere , anytime . In order to work on Big Data Analytics (ClickStream,Sentiment,RealTime) , its very important to work with PowerBI (PowerQuery & PowerMap) using Office 365. Microsoft Power Query Preview is an Excel add-in that enhances the self-service Business Intelligence experience in Excel by simplifying data discovery and access. 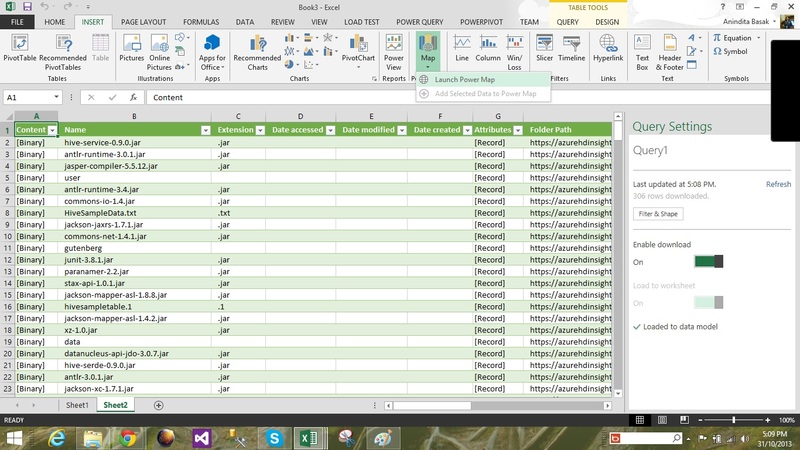 Power Query enables users to easily discover, combine, and refine data for better analysis in Excel. 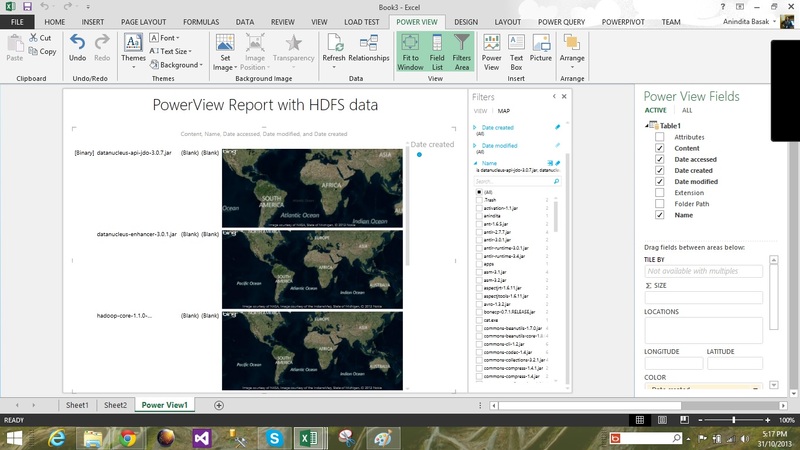 Power Map Preview for Excel 2013 allows you to plot geographic and temporal data visually, analyze that data in 3D, and create interactive tours to share with others. Download PowerQuery addin for Excel 2013 from here & PowerMap addins for Excel 2013 from here. Let me show you a brief overview about Power Query after installing the addins for excel. open the PowerQuery tab & check the data importing options. 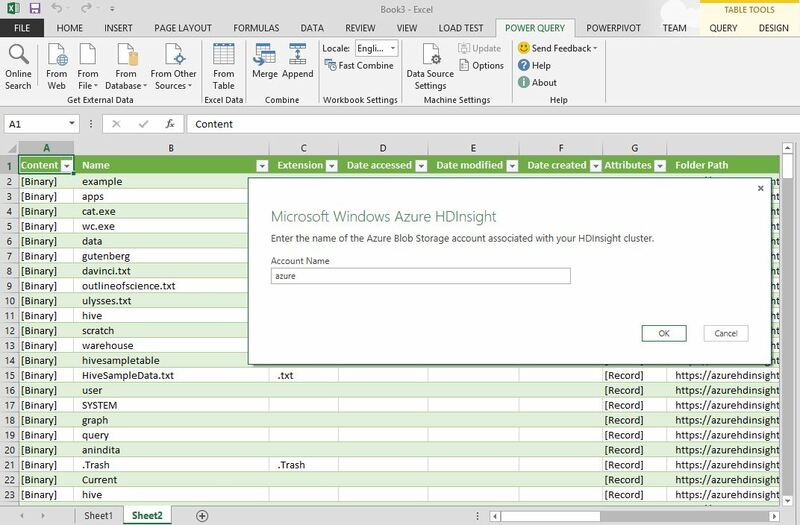 Under Data sources option on PowerQuery , you will find options to import data from HDFS, Azure HDInsight , even from Facebook too. For this demo, I have selected , HDFS (Hadoop distributed File System) & Azure HDInsight option. Lets first create a HDInsight cluster in portal. 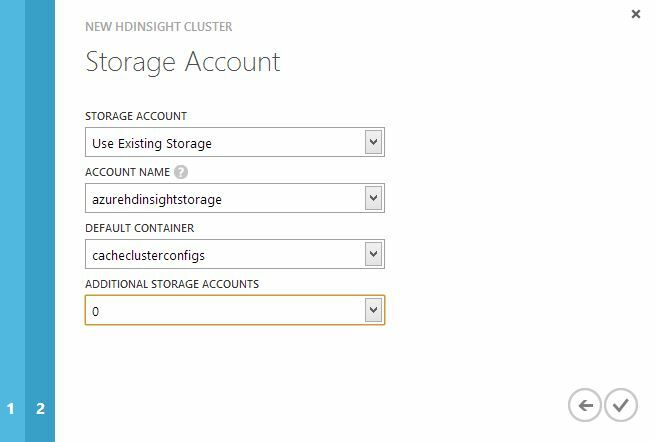 Next , provide final configuration values(Azure Storage Account Vaults [ASV] details) in order to create the cluster. Lets integrate the HDInsight cluster data with PowerQuery of Excel. 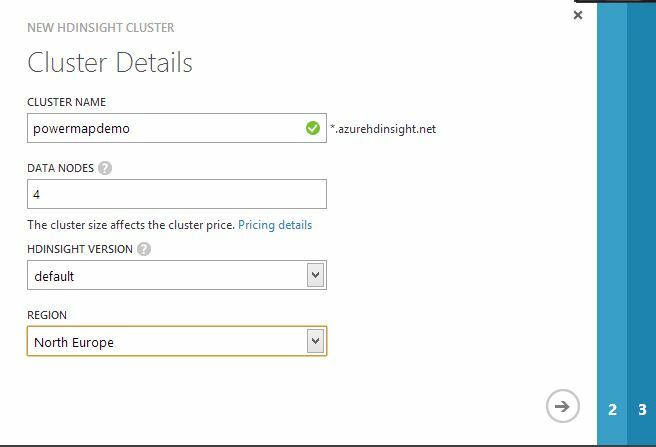 Choose ‘Data Sources‘ as ‘Azure HDInsight Cluster‘. On Query Editor, specify the hdfs table data by selecting appropriate query & click on ‘done‘. Next, click on PowerView in order to create an interactive dashboard with PowerView using PowerQuery from HDFS data of Azure Storage Vault(ASV). 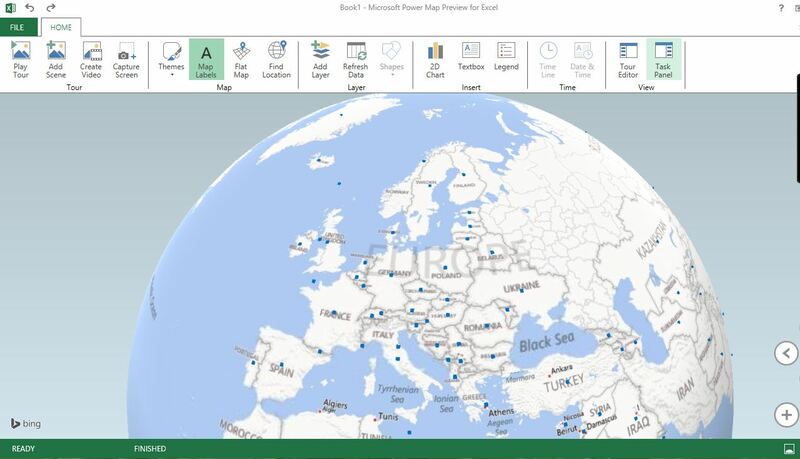 To work with PowerMap for Office 365: after installing the powermap addin , lets choose the ‘Map‘ option from ‘insert’ tab of excel 2013. Created a sample report using World Bank’s data on Income Basis from Windows Azure Marketplace which has been imported into hdfs. Created a video tour of the PowerMap dashboard using World Bank’s statistical data of countries by income level. Access it here.